I have been quiet for a while, my family needed my attention. Doesn’t mean I am not just as committed to running and raising money for Stand Up 2 Cancer, just needed to take a brief detour. But I learned a big lesson during this time, brought sharply into focus just this week. The power of “thank you”. 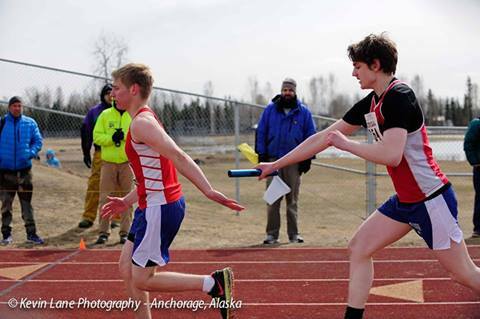 Last weekend Gill participated in the first ever Unified Track meet with Special Olympics and Alaska State High School sports. His acceptance as part of the team and opportunity to participate at the state level has given him such a boost of confidence and level of self-acceptance, put a spark back in him. I was so grateful for the positive impact of this experience. Gill hadn’t spoken words of self-loathing or desire for suicide in weeks. I know preparing for state competition had a lot to do with that. It was amazing. I was so overwhelmed with gratitude for the change I saw in him. I needed to let those who made this possible for him know how much I appreciate their gift to my son. I wrote an email. One I sent to the head coach of his track team, the other coaches didn’t have emails posted on the team website. Another email I sent to the local rep for Special Olympics. I told them just how grateful I am for the opportunity. I typed the emails pouring all of my gratitude and appreciation into them. I gave a little bit of Gill’s story, his journey getting to that point. The pain of bullying, desire for death, feeling of not belonging. Not all the gory details, but just enough so they could understand why I was so grateful. I sent the emails off never imagining what would happen next. The next day I got a call from the CEO of Special Olympics of Alaska, he had gotten the email I sent to the local rep. Jim was calling to thank me for my email. He felt inspired to work harder to get more inclusion sport opportunities in the schools. He told me he had shared it with the head of all Special Olympics, Tim Shriver. Mr. Shiver wanted my permission to use my letter in some promotional material. I said yes, if they thought it would help expand the inclusion program… How could I say no? I also got a call from the principal at my son’s school, he had somehow gotten a copy of the email I sent to the coaches. He wanted my permission to share my email with the Superintendent and School Board. To support these amazing coaches and promote more inclusion programs… again I said yes. Friday afternoon I got a call, from Tim Shriver. He wanted to thank me for my letter and tell me of the impact it had. He had passed it on to others within Special Olympics International. It had made an impact as far away as India, inspiring more work and dedication even that far away. He forwarded an email from another person who had just lost a friend to suicide. It had helped them. I sent a thank you, just wishing to express my gratitude to those who had made a positive impact on my family. Somehow my simple expression of gratefulness and gratitude became so much bigger. Rippled out beyond my tiny email, inspiring and impacting others. These people are thanking me, for thanking them. I have been asked to speak at an event for Special Olympics next month, I am not sure I understand how all that happened. But I have learned the power of thank you. I learned that thanking someone helps them know when they are on the right track, making a difference. Can give them strength to carry on when things seem tough. Tomorrow say thank you to someone, a deep heartfelt thank you. It doesn’t matter who or what it is for, just stop completely and say thank you. We take each other for granted so often, when we are appreciated it can change our whole outlook.